Det finns inget som kan kallas för ett standardmönsterkort. Alla mönsterkort har en unik funktionalitet som är anpassad för en specifik produkt. Att tillverka ett mönsterkort är därför en komplex process som innefattar många olika steg. I översikten nedan visas några av de viktigaste produktionsstegen i tillverkningen av ett flerlagerskort (multilayer board). När du köper mönsterkort från NCAB Group får du kvalitet som betalar sig över tiden. Detta garanteras genom vår mönsterkortsspecifikation och kvalitetskontroll som är mycket strängare än andra leverantörers, och som ser till att produkten håller vad den lovar. I produktionsflödet nedan kan du se vilka steg i processen som är unika för NCAB och vilka steg som har hårdare krav än vad IPC kräver. 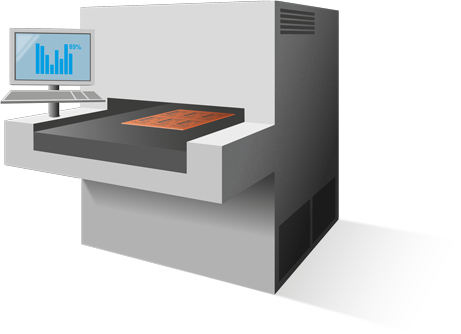 Customer supplied data (gerber) is used to produce the manufacturing data for the specific PCB (artworks for imaging processes and drill data for drilling programs). 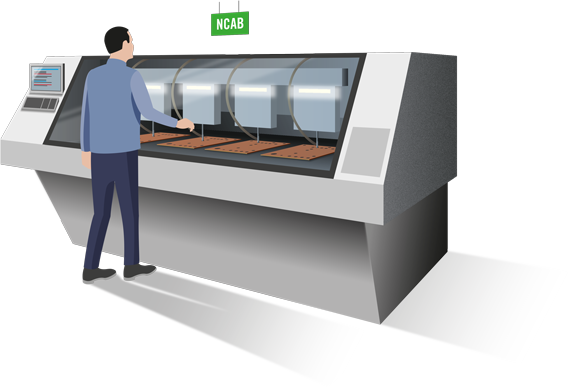 Engineers compare demands/specifications against capabilities to ensure compliance and also determine the process steps and associated checks. No changes are allowed without NCAB Group permission. very start of the process. 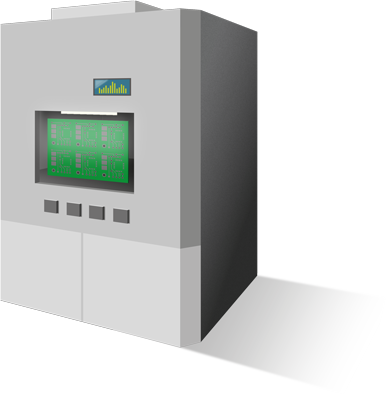 Material of various types are received from approved sources and held in controlled environments until required. 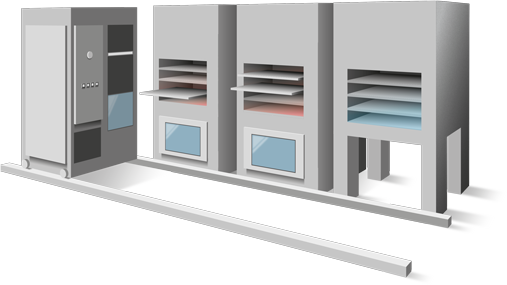 Using FIFO systems, specific material is released into production for a specific purchase order with base materials cut to the required sizes. All materials used can be traced back to their manufacturing batch. 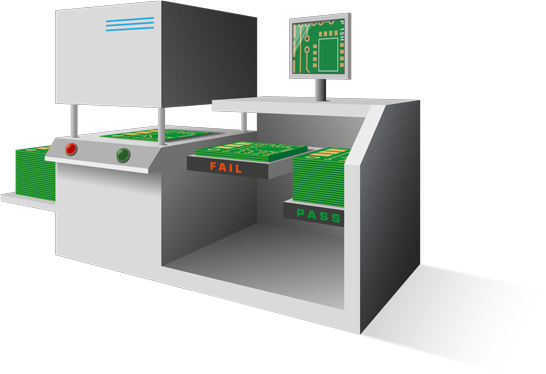 Inspection of the circuitry against digital “images” to verify that the circuitry matches the design and that it is free from defects. 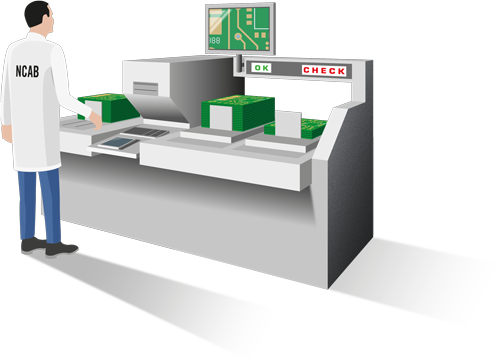 Achieved through scanning of the board and then trained inspectors will verify any anomalies that the scanning process has highlighted. 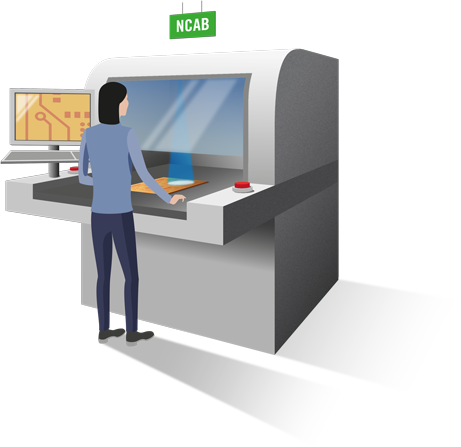 NCAB Group allows no repair of open circuits. 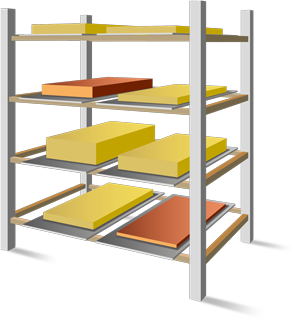 The inner layers have an oxide layer applied and then “stacked” together with pre-preg providing insulation between layers and copper foil is added to the top and bottom of the stack. 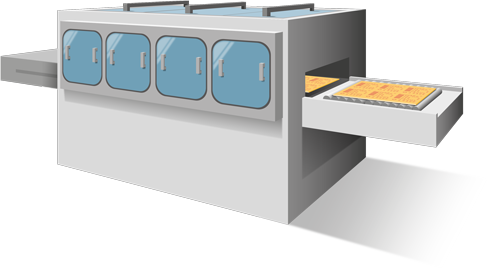 The lamination process uses a combination of specific temperature, pressure for a specific time to allow the resin within the pre-preg to flow and bond the layers together to form a solid multilayer panel. 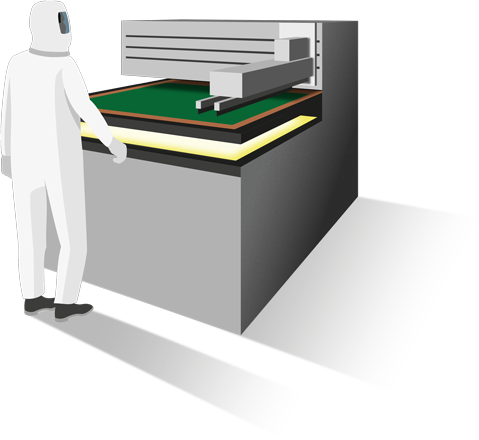 We now have to drill the holes that will subsequently create electrical connections within the multilayer PCB. This is a mechanical drilling process that must be optimised so that we can achieve registration to all of the the inner layer connections. The panels can be stacked at this process. The drilling can also be done by a laser drill, which is the case in the attached production video. PTH provides a very thin deposit of copper that covers the hole wall and the complete panel. A complex chemical process that must be strictly controlled to allow a reliable deposit of copper to be plated even onto the non-metallic hole wall. Whilst not a sufficient amount of copper on its own, we now have electrical continuity between layers and through the holes. 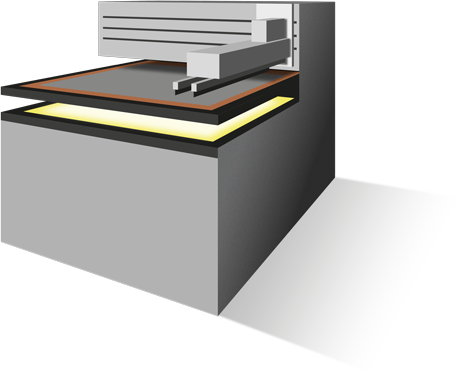 Panel plating follows on from PTH to provide a thicker deposit of copper on top of the PTH deposit – typically 5 to 8 um. The combination is used to optimise the amount of copper that is to be plated and etched in order to achieve the track and gap demands. standard (equates to IPC class 3). Similar to the inner layer process (image transfer using photosensitive dry film, exposure to UV light and etching), but with one main difference - we will remove the dry film where we want to keep the copper/define circuitry - so we can plate additional copper later in the process. 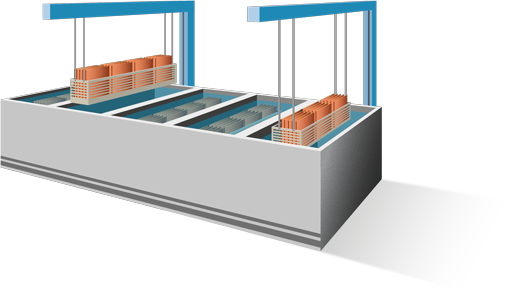 Second electrolytic plating stage, where the additional plating is deposited in areas without dry film (circuitry). Increases the plating thickness to meet demands including NCAB Group demands with and average of 25um / min 20um through the hole. Once the copper has been plated, tin is applied to protect the plated copper. 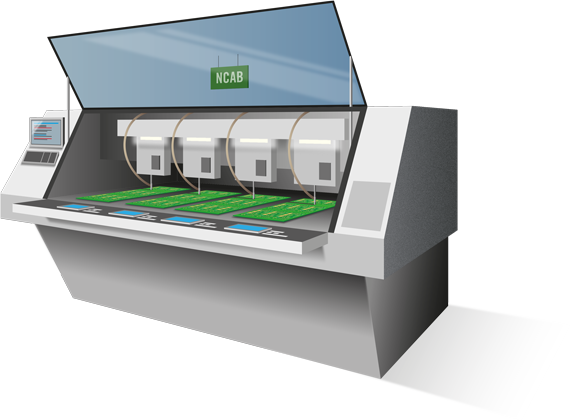 Just like with inner layer AOI the imaged and etched panel is scanned to make sure that the circuitry meets design and that it is free from defects. Again no repair of open circuits are allowed under NCAB Group demands. Using soldermask ink or epoxy resin and a prepared stencil, with holes in the stencil that align with the via holes we wish to plug, we use a screen printing process to push ink or resin into holes. 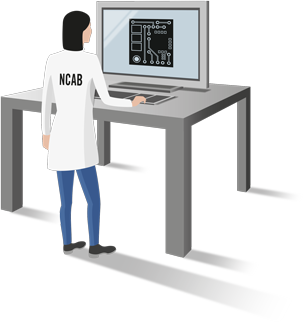 Unlike soldermask we are trying to push ink through the holes in the PCB and judge quality based upon the NCAB Group demands of ≥ 70% fill. force that could cause loss of soldermask. Used for checking the integrity of the tracks and the through hole interconnections – checking to ensure there are no open circuits or no short circuits on the finished board. There are two test methods, flying probe for smaller volumes and fixture based for volumes. welding or open circuit repair. 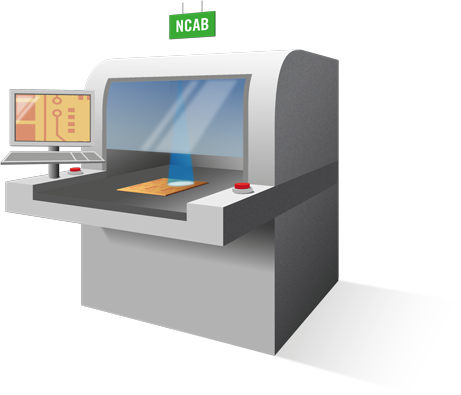 Visual checking the PCB against acceptance criteria and using NCAB “approved” inspectors. Using manual visual inspection and AVI - compares PCB to gerber and has a faster checking speed that human eyes, but still requires human verification. All orders are also subjected to a full inspection including dimensional, solderability, etc. 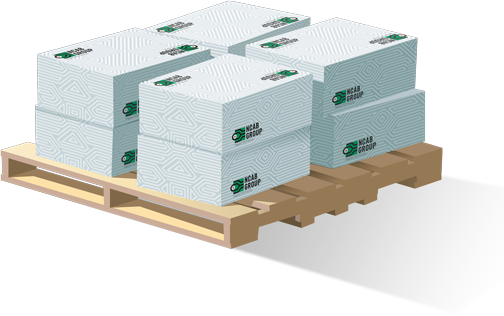 Boards are wrapped using materials that comply with the NCAB Packaging demands (ESD etcetera) and then boxed prior to be being shipped using the requested mode of transport.